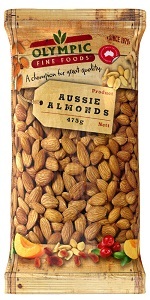 “Olympic Fine Foods Almonds are premium whole almonds packed full of flavour and nutrition. A favourite of the whole family, they can be enjoyed on their own or as part of your favourite recipes. Olympic Fine Foods Almonds are an amazing source of nutrition. They are full of healthy monounsaturated fats, known to help reduce cholesterol. Almonds contain dietary fibre and the antioxidant Vitamin E. They contain essential trace elements like zinc, magnesium, manganese, potassium and selenium. Olympic Fine Foods Almonds are also a great source of protein. Almonds also contain the amino acid Arginine as well as plant sterols. They really are packed full of nutrition! Not only that, Olympic Fine Foods Almonds taste great too. A handful of almonds make a terrific snack and the kids will love them. They also make a versatile ingredient in your cooking. Adding Olympic Fine Foods almonds to your favourite recipe is a sure fire way of turning a good meal into a great meal. Try them in a stir fry, add them to your baking or toss a handful in a salad. With Olympic Fine Foods almonds, adding flavour and nutrition to your next meal has never been easier. Savour them on their own or use as a wholesome addition to any meal. Try them in a stir-fry, salad or dessert.